Visual learner? 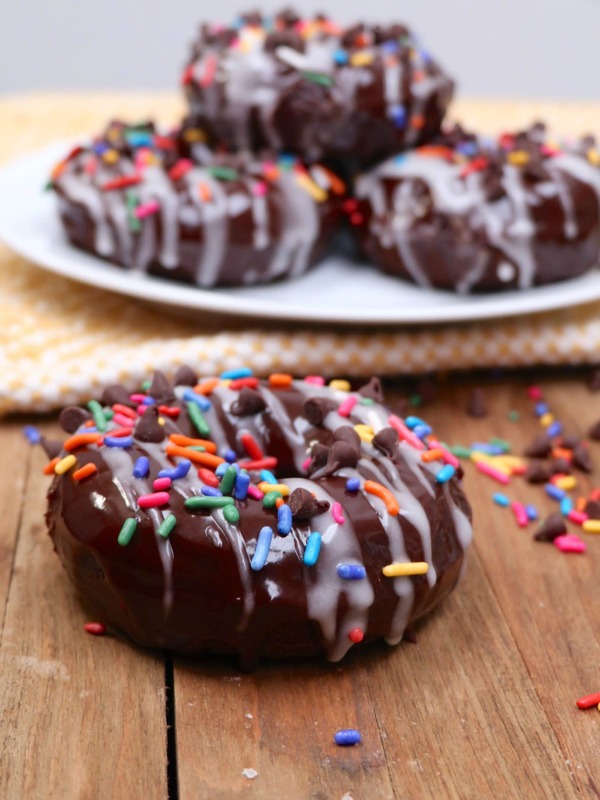 Watch me make these baked chocolate doughnuts from start to finish! Ok, I’ve got to ask, do you spell it donut or doughnut?? Anytime I write a post about doughnuts I feel conflicted. I spell it both ways and it’s so frustrating to me. Why must there be two ways to spell it??? And for the love of all things holy why can’t I just pick one??? I don’t know what’s going on with me lately yall, but I’m really starting to prefer making baked doughnuts over cake and cupcakes. I know. What the heezy, right? My apologies if I start to get a little donut crazy. Donuts are just plain fun to eat. Whether is the yeasty kind, old-fashioned cake kind, or these light and baked kind. But there is something about these baked chocolate donuts that take me back to my easy-bake oven days and I’m a sucker for any food that gives me feel-good, childhood nostalgia. Not to mention, baked donuts are just so daggum easy! My frosting-challenged self can actually get these donuts decorated nicely….. and totally enjoy the process!! Omg… I think I may have found another one of my life callings! Ok so let’s talk about this chocolate on chocolate baked donut goodness. For starters, they are so easy to make! They are basically just cake. I don’t care how you slice it or what you call. If it tastes like cake, has the same crumb as cake…then by golly it’s cake! 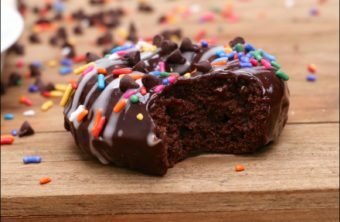 They have the texture and flavor of a devils food cake and I guarantee if you put out a chocolate cake next to a platter of these baked chocolate doughnuts, the doughnuts will go first! Especially if you have kids around. MOST IMPORTANT TIP EVER: Before I forget let me tell you something about cake doughnuts. DO NOT OVER STIR THE BATTER! I’m not yelling with the caps but I just wanted you to see it. Over stirring the batter will result in dense, rubbery cupcakes. I have a self-diagnosed compulsive stirring obsession so this is hard for me, but I fight my urge and get fluffy, cakey doughnuts every time (well except for those times that I over-stirred) Once, you mix the wet and dry ingredients, stir JUST until the batter is combined. You’ll notice that these baked chocolate doughnuts are lightly sweetened if you taste one before adding the glaze. This is necessarily being that they are coated with an easy chocolate ganache and vanilla drizzle + any extra decorations you might want to add! They are made to be glazed so don’t skip it mkay. 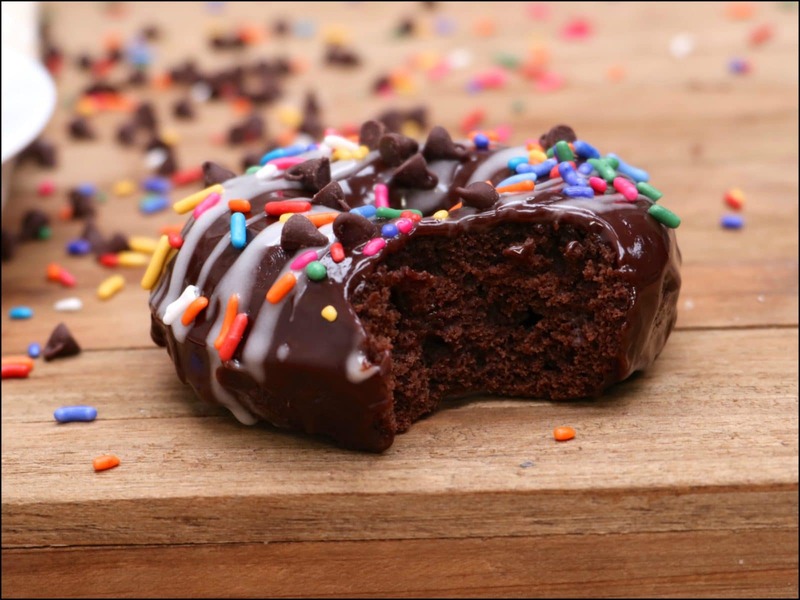 We like to top these baked chocolate donuts mini chocolate chips and sprinkles. You can certainly get more adulty and go with nuts & salted caramel drizzle. I’m dreaming of a German chocolate version, mercy! I got this handy lil donut pan on Amazon. You can find it here. I’m not big on have specialty pans, but this guy earned his place. Even if he only gets used a few times a year. TOPPINGS: mini chocolate chips, sprinkles, etc. Grease a donut pan. Set aside. In a large bowl whisk together flour, baking soda, salt, unsweetened cocoa powder, and brown sugar. Set aside. In a separate bowl, whisk together, buttermilk, coffee, egg, and vanilla extract. Stir in butter and stir JUST until butter is combined. Spoon batter into prepared doughnut pan, filling ¾ full. Allow donuts to sit in pan until they have cooled down enough to remove from pan. Remove donuts from pan and place on cooling rack to finish cooling. 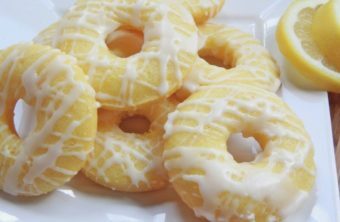 While donuts are cooling, prepare vanilla drizzle by stirring together powdered sugar, vanilla, and enough milk to create an Elmers glue-like consistency) Set aside. To make the chocolate ganache, heat heavy whipping cream to a small saucepan until it begins to simmer lightly. 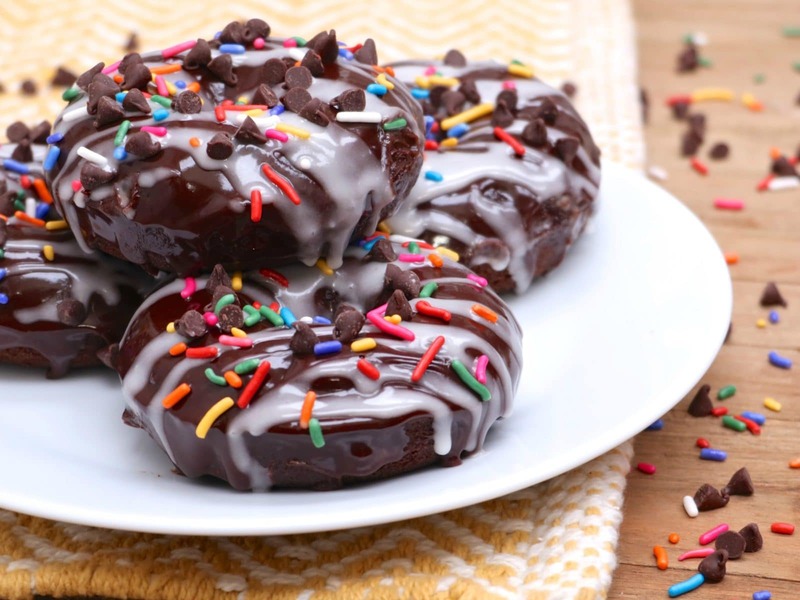 Spread chocolate ganache in a thin layer over donuts and let set. Once set, drizzle on the vanilla glaze. Add toppings and allow glaze to harden. Once you add the wet ingredients into the dry ingredients, stir just until combined. Over stirring will result in dense, rubbery donuts. I made these tonight and they came out great. Thank you love!! I got those from Ikea. I’m going to try this but where did you get the donut pan. I like old fashion donuts.